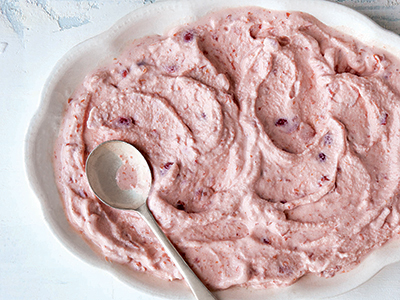 Send summertime vibes all year long with this cool, lightened-up cherry dessert. 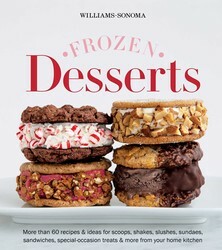 From Williams-Sonoma Frozen Desserts. 1. In a food processor, combine the cherries, sugar, corn syrup, and salt and process to a fine purée, about 1 minute. Transfer to a bowl and stir in the yogurt. 2. Cover the bowl with plastic wrap and refrigerate until the yogurt mixture is very cold, about 1 hour. 3. Prepare an ice cream maker with at least a 1-qt. capacity according to the manufacturer’s directions. Remove the plastic wrap from the bowl, pour the yogurt mixture into the ice cream maker, and churn until the mixture reaches the consistency of thick whipped cream. 4. Transfer the frozen yogurt to a plastic freezer container, cover tightly, and freeze until firm, at least 2 hours or up to 3 days. Create homemade masterpieces like spiced pumpkin ice cream, honey-lemon frozen yogurt, orange sorbet and sangria granita. Embellish your dessert with zesty gingersnaps, fudgy brownies or a boozy butterscotch sauce. Walk down memory lane (without leaving your kitchen) for an old-fashioned chocolate malt or a modern root beer float . With over 60 recipes, this book is the ultimate resource for frozen dessert bliss.